Floors have a big impact on the overall look of an interior space, yet they are often restricted to typical neutral materials with little character and no special visual appeal. While neutral materials are the tried-and-true solution for creating versatile spaces, more daring solutions can take an interior from shy to spectacular. Here are a few examples of floors with personality and pizzazz that can single-handedly change the look and feel of your space. Choosing wood floors does not mean giving up color or settling on a neutral background for your decor. If you need a space with character that do justice to your unique products or services, decorative wood flooring is the answer. Today, the choices are abundant. Engineered wood planks enhanced with graphics can turn your floors (or even walls) in surfaces as colorful or as bold as you want, while still offering you all the advantages of typical wood floors. 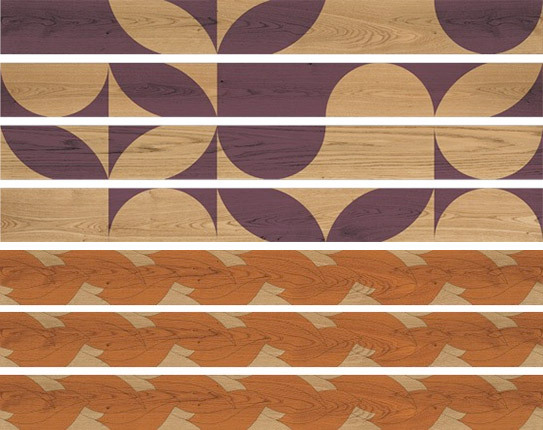 The Grafix decorative flooring, for instance, available on materials-inc.com, offer designs that range from bold geometric patterns to delicate florals. Wood floors can become true works of art when left in the hands of an inspired artist. 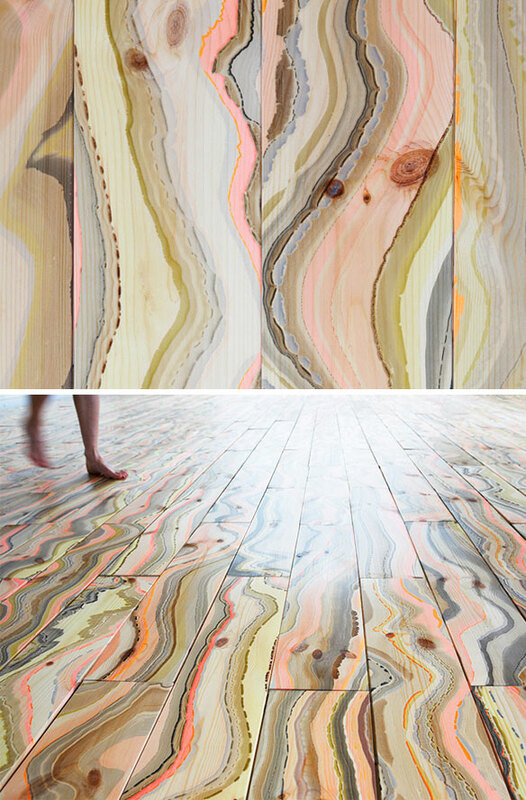 Using the traditional art of marbling, Pernille Snedker Hansen, the creator of the Copenhagen-based Snedker Studio, emphasizes the natural beauty of the wood by using color to recreate the look of naturally occurring tree rings. Her parquet floors are extraordinary displays of ingenuity, a symbiotic product of natural beauty and human artistry. 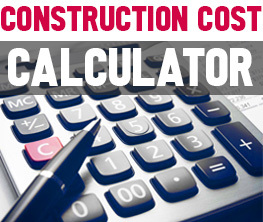 While wood floors, even when neutral, have a natural warmth that pleases the eye, cement is a less forgiving choice. 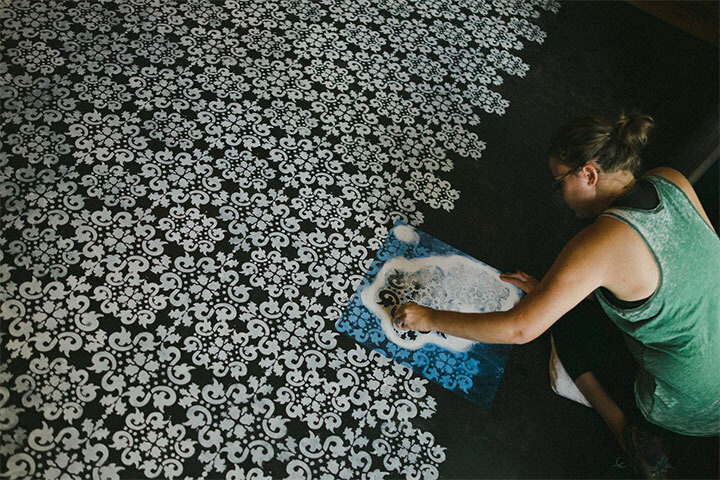 Yet, cement floors are a perfect canvas for artistic undertakings. Paint, sealer and a stencil, combined with some enthusiasm and elbow grease, can transform this cold surface into the focal point of a room. Especially when light paint is used on top of a dark-colored floor, the result is dramatic. Finally, if “bringing nature in” is a common design goal often pursued by adding plants or a simple nature-inspired piece of art to the general design, some are taking the idea a step further. 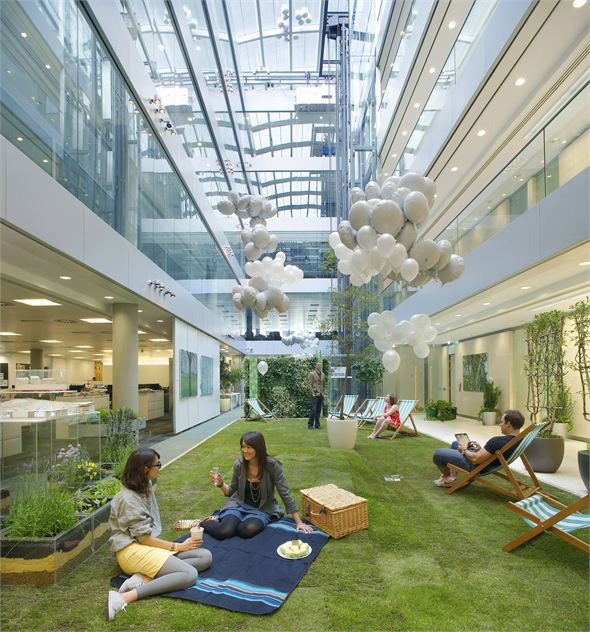 The HOQ offices in the Qube building located in London’s Fitzrovia neighborhood, include a relaxing park-like area designed for relaxing and recollecting, where the floors are recreating the interior of a garden, grass and mounds included. It is an unexpected twist that tricks the eye and raises the spirit – something that is not often said about floors.